Krishna Janmashtami 2014 kids in Austin are invited to be as creative as they like… be Radha, Krishna, be a Gopi, or dress up as a cow, flute, peacock feather. 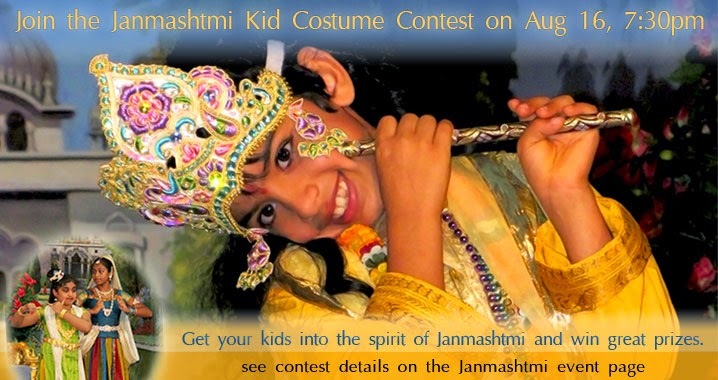 The idea for the contest came from the aim to get kids in Austin into the spirit of Krishna Janmashtami 2014 and give them devotional memories of this special day. All participating kids will win prizes; but there will also be special prizes for the contest winners. Another exciting feature of the Krishna Janmashtami 2014 celebration in Austin is that kids will “meet” Saints & Gods from Krishna Avatar who will relay inspiring stories of Krishna. There are lots of inspirational spiritual websites these days - here's one more. Please subscribe by clicking "Join this site" below. Read it every morning for inspiration throughout the day. All writings are by Swami Nikhilanand, based on the teachings of Jagadguru Shree Kripaluji Maharaj. If you have any spiritual questions, you are directed to post them on Swami Nikhilanand's facebook page. Radhey Radhey.